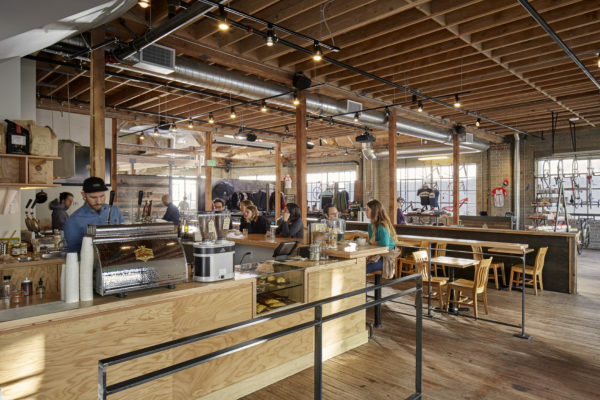 Located in Capitol Hill, Métier is an adaptive reuse of a 1900’s Auto Row warehouse building, which was originally constructed as an auto parts retail store and was most recently used as a second hand thrift shop. We were tasked with minimizing our intervention to the building structure and avoiding triggering a substantial alteration while introducing and blurring together multiple program areas: a retail store, a café & bar, exercise & training facilities and a bike repair shop. The strategic decision to remove a portion of the main floor plate to facilitate access to the lower level via a new central stair also succeeded in extending daylighting to the basement and establishing a visual connection between all three levels. The intervention of the stair revitalized the character of the building while remaining honest to the existing building form. We stripped the building down to its natural materials, colors, and textures from top to bottom, revealing some of the history of the building as well as its construction means and methods. These discoveries served to reinforce our early design decisions while guide and inform our finish material choices for the new facility.